Was Oswald Bottle-fed by NANA? With the intent of returning to the United States, ex-Marine and American defector Lee Harvey Oswald wrote a letter from Russia to former Secretary of the Navy John Connally whom he was later accused of shooting, trying to get his Marine discharge corrected. After more than a year without communication, Oswald’s mother wrote to tell him that his discharge had been downgraded from honorable to undesirable. Oswald drafted the letter to Secretary of the Navy Connally, attempting to appeal his status. Oswald had defected to Russia shortly after being discharged from the Marines in 1959. He had a good record in the military, held a top-level security clearance, monitored the U-2 spy plane as a radar operator in Japan, and had good grades in a Russian language test after taking accelerated courses, apparently at the Monterey Language Institute (Now the Defense Language Institute). The circumstances of his discharge from the Marines were unusual. A letter documenting an injury his mother had sustained (nasopharyngitis from a blow to her nose), used as a basis for his early dismissal, arrived several days after he was granted a “hardship discharge.” It had been a fully honorable discharge at the time, ostensibly allowing him to return home to support his injured mother. Oswald returned home, however he shortly afterward boarded a tramp steamer for Europe on the first leg of a journey that would take him behind the Iron Curtain, from France and England to Helsinki and Moscow, where he turned over his passport to the US Embassy officer Richard Snyder, announcing his defection. After his defection received press attention in the United States, the Marines held a court-martial in Oswald’s absence, changing his discharge to undesirable. It was illegal to hold such a court martial “in absentia,” and improper to base the grade of discharge on events that occurred after his military service ended. Oswald later assumed an infamous position in American history as the alleged assassin of President John F. Kennedy, and is also alleged to have shot then Texas Governor John Connally and Dallas police officer J. D. Tippit. But whether the victim is the President of the United States or a bum in the street, in every homicide investigation, the approach to solving the murder must address the means, motive and opportunity to commit the crime. The actual motives and real behavior of Lee Harvey Oswald were never ascertained. By the time Oswald wrote this letter, Connally had been replaced as Secretary of the Navy by Fred Korth, a Fort Worth attorney. Oswald was not unknown to Korth, since Korth had represented Oswald’s stepfather in his divorce from his mother, Marguerite. Korth became embroiled in a scandal as Secretary of Navy in regards to the controversial TFX fighter, and had to resign a few weeks before the assassination. One of the reporters Oswald complained about in his letter to Connally was Priscilla Johnson McMillan. According to Priscilla Johnson McMillan, Oswald wrote in the style of one of his favorite authors, George Orwell, keeping a typewriter wrapped in a blanket so that the noise would not alert suspicions, and he went to great lengths to smuggle out manuscripts when he left the Soviet Union. She also notes that Oswald also took a fancy to Ian Fleming’s James Bond spy thrillers. This rather romantic view of Oswald as a dissident writer may have more to do with Priscilla’s imagination than his own. She is also the author of “Khrushchev and the Arts: The Politics of Soviet Culture 1962-1964,” which presents embellished profiles of some Soviet writers as dissidents. But Oswald never specified the 20’s in his analogy, and Priscilla Johnson McMillan’s conjecture on this point is speculative. A more convincing argument could be made that Oswald was referring to Hemingway’s stay in Paris in the 1940’s instead. 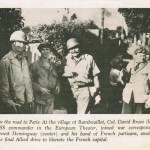 In 1944 Hemingway was in France, not just as a journalist, but as a war correspondent attached to the Office of Strategic Services (OSS), and a comparison of Oswald’s experiences and Hemingway’s later activities is even more revealing. Out of Key West, Florida and Havana, Cuba, early in the war Hemingway served as a special agent for the U.S. Office of Naval Intelligence (ONI), using his fishing boat “the Pilar,” to patrol for Nazi submarines. While working as a war correspondent for the North American Newspaper Alliance (NANA), Hemingway wrote about the war and life on the front lines, and sometimes behind the lines. Hemingway’s son was a member of the JEDBERGs, a joint UK-USA detachment trained as commandos in England and parachuted behind the lines to organize resistance to the occupying Nazi armies. Hemingway’s son was captured by the Germans and spent the rest of the war in a prisoner of war camp. 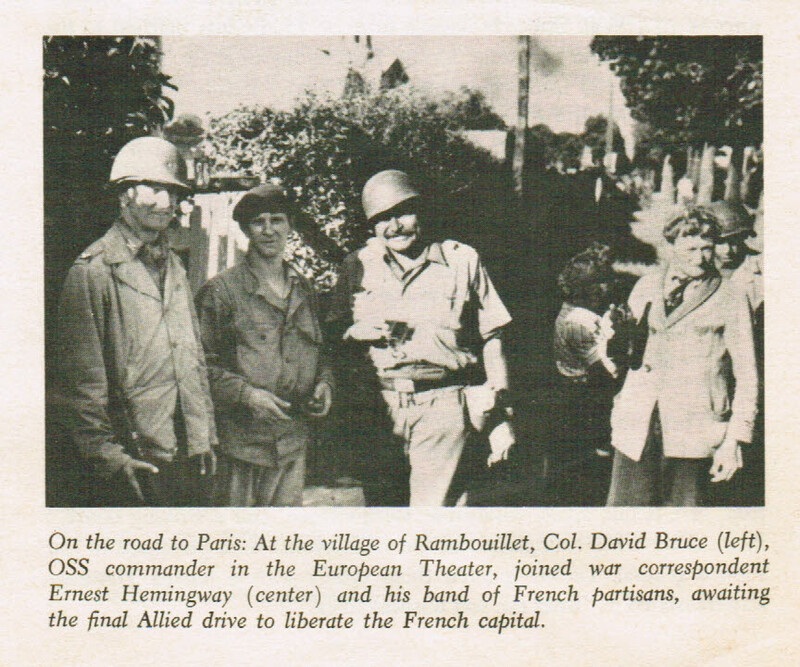 Hemingway himself organized and led a loose band of French resistance fighters and, along with OSS Col. David Bruce, participated in the liberation of Paris. Bruce was the senior OSS officer on the ground in the European theater of operations. Bruce would later serve as best man at Hemingway’s wedding and JFK’s Ambassador to the Court of St. James. Riding a jeep at the head of a convoy of trucks of armed partisans, while French General LeClerc accepted the surrender of the German general at the train station, Hemingway and Bruce liberated the bar at the Hotel Ritz, where Hemingway also lived on occasion. Today, the Hemingway Bar at the Ritz is named in his honor. Placing his gun on the bar, when the bartender asked what he wanted to drink, Hemingway looked around, counted heads and said, “Sixty vodka martinis.” Of course that would be “shaken,’ not stirred,” as a strong case can be made that Oswald went behind the Iron Curtain in the same way as Hemingway went to Paris in 1944, when it was still “behind the lines,” and not as a writer, but as an intelligence agent. The Warren Commission, appointed by President Lyndon B. Johnson to investigate and report on the assassination of President Kennedy, automatically assumed that the Soviet journalists who interviewed Oswald in Russia were KGB agents, but they never voiced a similar suspicion that the American journalists who interviewed him had U.S. intelligence connections as well. The idea of journalists being used as spies or intelligence agents posing as journalists is not a new one. The British circle of W. Somerset Maugham, Noel Coward, Malcolm Muggeridge, Kim Philby, Cyril Connally and Peter and Ian Fleming serves as a good example, especially because it comes into play here. When information about the CIA’s “Family Jewels” was released in the late 1970s, the agency’s use of journalists as spies was exposed, along with other nefarious activities, such as behavior modification, MKULTRA drug experiments and the attempted assassination of foreign leaders. During World War II there was a popular song, “A Mockingbird Sang on Berkley Square,” which was near the then secret British code-breaking detachment. Former CIA director Richard Helms worked as a reporter for UPI in Germany before World War II, managed an exclusive interview with Adolph Hitler, and is one of the few people who can’t remember where he was when John F. Kennedy was killed. Penthouse magazine revealed that the Copley News Service out of San Diego, California, was run by former OSS spies and was actively used to promote CIA propaganda and disinformation. It has since been learned that dozens of similar operations existed. The University of Missouri School of Journalism produced “Soviet Affairs Expert” and “KGB” author John Barron, who worked with U.S. Naval Intelligence before joining Readers Digest. That firm also published his book, and supported the research of Edward J. Epstein, author of “Legend: The Secret Life of Lee Harvey Oswald,” which makes the case that Oswald was more than just a crazed lone-nut. Readers Digest also supported Henry Hurt’s research for a book on the assassination of President Kennedy, but after it took a conspiratorial bent he had to find another publisher. The first American reporter to interview Oswald in Moscow, Aline Mosby, was also a graduate of the University of Missouri School of Journalism and worked as a correspondent for UPI. Oswald and Mosby talked for two hours, while Oswald explained his reasons for defecting to her, and the listening Soviet ears. On the same day Priscilla Johnson spoke with Oswald in Moscow, his fingerprints were pulled from FBI files in Washington. Priscilla later admitted that she sought Oswald out “on the advice of an American colleague in Moscow.” The colleague turned out to be John McVicker, an Embassy officer and assistant to Richard Snyder, Oswald’s primary contact at the US Embassy. Snyder had connections to the CIA, and his intelligence background was later exposed at the spy trial of Oleg Penkovsky, an American double-agent during the Cuban missile crisis, who was executed. If Snyder was an intelligence officer, then so was McVicker, and if McVicker was Priscilla Johnson’s “colleague,” it is likely so was she. In fact, the files released under the JFK Assassination Records Act reveal that Johnson was a “witting informant” and valuable asset if not an agent of the CIA. When Oswald renounced his citizenship he handed over his passport to Snyder, a passport that said Oswald was in the “import-export” business, just as Ian Fleming’s fictional 007 had the cover job of working for “Universal Export.” Actually Oswald did work in the “import-export” business shortly before he enlisted in the Marines. When he was only sixteen years old, Oswald worked as a messenger for Leon Trujague & Company, a New Orleans import-export company. Trujague was on the board of directors of the Friends for Democratic Cuba, an anti-Castro Cuban organization that used Oswald’s name, while he was in Russia, to purchase jeeps to be used for covert operations against Cuba. When he handed over his passport to Snyder, Oswald threatened to apply for permanent citizenship in the Soviet Union. But when his “stateless persons” permit expired, Oswald only applied to extend it. Snyder kept Oswald’s passport handy, in his desk drawer, and handed it back to him when Oswald told Snyder he was ready to return home with his Russian wife Marin. Snyder also assisted in getting them clearance and travel funds from the State Department. In an amazing coincidence, Oliver Hallett, the Navy attaché at the US Embassy in Moscow – who was apparently in the room at the time Oswald handed over his passport and announced his defection – was also the Navy officer in the White House Situation Room on November 22, 1963. Hallet relayed the wire service reports to the Cabinet Plane and Air Force One that Oswald had been arrested as a suspect in the assassination. Hallett’s wife, a receptionist at the Embassy, also met Oswald in Moscow, and escorted him to Snyder’s office. In book reviews for the New York Times, the Philadelphia Inquirer and New York Review of Books she consistently praised those who support the Warren Commission’s conclusions, such as David Belin’s “You Are the Jury,” while criticizing those who suggest there is evidence of conspiracy, like “The Fish Is Red” by William Turner & Warren Hinckle. Of course, if Oswald was the assassin, and not the patsy, and he was in fact a deranged lone-nut case who was acting on his own perverted, psychological motives, then there would be no meaning to what happened at Dealey Plaza. But if Oswald was set up as the patsy, or was one of the snipers who was part of a well planned and executed covert intelligence operation, then the assassination, whatever you believe happened at Dealey Plaza, is infused with meaning and makes political and historic sense when placed in the proper context. If Oswald was a patsy, it also means that Oswald was innocent of the crimes attributed to him, and others have gotten away with murder. The task of the posthumous reconstruction of Oswald’s real background resembles peeling the layers of an onion. Oswald has been variously portrayed as an agent of Cuban or Russian intelligence, a ‘lone nut’ and a Mafia hit man, but none of these portraits explains his defection and subsequent activities in New Orleans and Dallas, his association with both the Fair Play for Cuba Committee (FPCC) and Student Revolutionary Directorate (DRE), or his conduct and statements on the day and day after the assassination. In reality, Oswald, the alleged assassin, as a pawn in a much larger game, played only a small but critical role in the covert operation that left the President dead and a new government in power. The framing of Oswald was a critical part of the cover-up. Establishing possible false motives for his actions, especially after he was dead, became the primary occupation of the Warren Commission and the media, while subsequent psychological profiles of Oswald, assuming he was the killer, ignore the political power plays and the broader context in which he moved. Some of these “studies,” especially those that maintain Oswald was the lone assassin and acted on psychological motives, are deliberately deceptive; and journalists who played more than a passive role in this endeavor must be held suspect and accountable. Oswald seemed doomed to a succession of negative characterizations from supposed friends and seemingly sympathetic acquaintances who were later to denigrate him and implicate him in the murder of Kennedy. Priscilla Johnson McMillan was merely one of the first. Priscilla Johnson was a Russian major at Bryn Mawr College, on the Main Line in Philadelphia, and was intimately entwined with the US intelligence community. While a college student she was a World Federalist, an organization that tried to persuade the nations of the world to form a “world government” and strengthen the United Nations. Cord Meyer, Jr., one of the founders of the World Federalists, and a former New York neighbor of Johnson, went on to become a deputy to CIA director Allen Dulles and the head of the CIA’s International Organizations Division. While Kennedy went on to become President, Priscilla Johnson worked as a translator for the State Department and the New York Times. She has threatened libel suits against publications that claim she worked for the CIA, but has never followed up on these threats. Priscilla Johnson claimed that because she couldn’t get a security clearance for government work, she went to Moscow as a correspondent for the North American Newspaper Alliance (NANA). NANA was a large and prominent American news and feature service syndicate that once competed with Associated Press (AP) and United Press International (UPI) wire services, and included Ernest Hemingway as one of its correspondents. Although an officer assigned to the Office of Naval Intelligence (ONI) at the time, Kennedy was quickly reassigned to the South Pacific. In the mid-nineteen fifties, NANA was purchased by former British Intelligence officer Ivor Bryce and his American associate Ernest Cuneo, who served in the Office of Strategic Services (OSS). The funds for the purchase of NANA reportedly came from the proceeds of the sale of one of Bryce’s Texas oil wells. Ivor Bryce, an independently wealthy millionaire, and Cuneo, were both close friends and associates of Ian Fleming, so after the war, when they purchased NANA, they hired Fleming to be the European Editor. During the war, Ian Fleming served as assistant to the chief of British Naval Intelligence. Fleming came to America and met Cuneo while visiting Sir William Stephenson at his New York apartment. Stephenson, a Canadian industrialist, had replaced Sir. William Wiseman as the representative of British Intelligence in the United States. While on a wartime mission to the United States, Fleming wrote out an outline for the establishment of a permanent American intelligence agency, based on the British model, and was given a gun, a .38 Police Positive revolver from Donovan for his efforts. Ernest Cuneo, a New York attorney, had served as an aide to New York mayor LaGuardia and as a wartime assistant to President Franklin D. Roosevelt, with an officer’s rank in the OSS. Cuneo was one of the main liaisons between President Roosevelt, William “Big Bill” Donovan, chief of the OSS, and William “Little Bill” Stephenson, aka “a man called INTREPID,” the representative of British Intelligence in the United States. During World War II, Ian Fleming had helped organize Operation Goldeneye, a plan for the defense of Gibraltar, and parachuted into France during the Nazi blitzkrieg on a mission to convince French Admiral Darlan to move his fleet to a neutral or English port. Fleming was unsuccessful, and Darlan’s fleet fought the Allied armies in North Africa and Darlan himself was assassinated, probably by British agents. Fleming was more successful in helping Yugoslavian King Zog to escape the Nazis. His brother, Peter Fleming outranked him in the Naval Intelligence services and was part of Operation Sea Lion. Fleming had accompanied Ivor Bryce to Jamaica for a wartime conference on U-boat warfare in the Atlantic, and after the war, Fleming became Jamaican neighbors with others who maintained vacation homes along Jamaica’s north shore, including Bryce, Stephenson and Noel Coward. Fleming’s house there was called Goldeneye. So when Priscilla Johnson went to Moscow as a correspondent for NANA, when she interviewed Lee Harvey Oswald at the time of his defection, Ian Fleming was NANA’s European Editor and Ivor Bryce and Ernest Cuneo signed her checks. One of the most important operations at the Center was the CIA sponsored refugee interview project, which “debriefed” émigrés from Communist Russia, Poland, Yugoslavia, Hungry, Rumania and East Germany, code-named Operation WRINGER. The Harvard Center worked closely with the West German Intelligence (BND), which was directed by former Nazi General Reinhard Gehlen. It was Gehlen who established and supervised WRINGER, attempting to penetrate the Soviet Union and reinforce his spy network inside Russia. Gehlen had been Hitler’s intelligence chief for the Nazi German “Armies East,” the Russian front. His files and network, turned over to the Americans at the end of the war, served as the foundation for the American CIA files and operations against the Soviets. The Center actually published two versions of “Dynamics,” written by Walt Rostow. One version of Rostow’s book was for government policy makers and CIA readers and the other for the general public. According to “Cult of Intelligence,” the MIT Center also assisted Rostow in other ways. Rostow was a political scientist with intelligence ties that date back to his OSS service during World War II. Rostow went on to become an assistant for national security affairs under both Presidents Kennedy and Johnson. It is also interesting to note that Walt Rostow first recommended that he appoint a commission to investigate the assassination of President Kennedy. In addition to Priscilla Johnson’s affiliation with the MIT CIS, Oswald’s cousin Dorothy Murret had a curious connection to the Institute. According to some Warren Commission and FBI documents Murret, “was linked in some manner with the …. apparatus of Professor Harold Isaacs.” Issacs was an MIT professor and CIS associate who had resided in China from 1931 to 1936 where he edited a local English language newspaper, The China Forum, and contributed to Newsweek and the Christian Science Monitor on Far Eastern affairs. Much of his work took him away from MIT, and it is possible he met Murret during the course of her travels. Even Priscilla’s family seems to have been involved in the tangle of Soviet émigrés, American spies and intelligence agency-run publishing efforts. One of the most important keys to the real history of Soviet leadership, Svetlana Stalin, the daughter of Soviet dictator Joseph Stalin, defected to the United States through India with the assistance of the CIA. Stalin had died mysteriously of a blood clot to the brain after being given drugs by his new doctors, drugs that were supplied by outside interests, possibly even the CIA. When Stalin’s daughter arrived in the United States, she was a prime candidate for debriefing and funneling through Operation WRINGER, and soon after her defection she was taken to the home of Stewart H. Johnson of Locust Valley, New York, Priscilla Johnson’s father. Priscilla then returned home and helped to translate Svetlana’s memoirs and two other books, including “Twenty Letters to a Friend,” which the CIA helped to publish. After the murder of Oswald, Priscilla Johnson McMillan was one of the only writers allowed to have access to Oswald’s wife Marina, and she obtained the exclusive contract to write Marina’s story, for which they both got paid. That book, fifteen years in the making, was eventually published as Lee and Marina. As Marina’s friend, advisor and ghost writer, Priscilla communicated with and coached Marina’s testimony before the House Select Committee on Assassinations (HSCA) in 1978. Both the Warren Commission and Priscilla Johnson McMillan suggest, in their portrayals of Oswald, that he held the personal political beliefs of a communist, while actually associating with rich, right wing oil executives like George Bouhe, George DeMohrenschildt and Paul Ragoridsky in Dallas, and fanatic anti-Communists like Guy Banister, David Ferrie and Carlos Bringuier in New Orleans. From a military family, Oswald was determined to become a Marine like his older brother Robert. Another half-brother, Edward Pic served in the Coast Guard at New York harbor before enlisting in the Air Force. Oswald’s favorite book and TV program, “I Led Three Lives,” by Herbert Philbrick, concerned an undercover FBI agent who infiltrated communist groups for a decade before exposing his true beliefs when testifying against his former friends in court. It is possible that Oswald was recruited and trained for counter-intelligence work while serving as a Marine in Japan and California, possibly by the Office of Naval Intelligence (ONI), the American intelligence agency that was reportedly responsible for a fake Soviet defector program that Oswald may have been a part of. The circumstances of Oswald’s “defection” clearly suggest that he was sent as a military intelligence agent to penetrate the Soviet Union and test and monitor their response to his defection. In Russia, he became affiliated with another anti-communist network that included a similar “defector,” his factory foreman Alexander Ziegler and his family. Ziegler, a Jewish émigré during World War II, left Argentina, where he had worked for an American company, and resettled in Byelorussia. Ziegler was Oswald’s nominal boss at the radio factory where they worked in Minsk, and he encouraged Oswald to marry Marina. When Oswald was ready to leave Russia, Ziegler reportedly gave him an envelope to smuggle to the U.S. Embassy in Moscow, which was addressed to CIA director Allen Dulles. Oswald once traveled to Moscow alone and met some American tourists, two young women and an older lady who had lost their official Intourist guide and were traveling unescorted around Russia. A few weeks later Oswald met the same trio in Minsk, and can be seen in a photo of them together, a photo that ended up in the files of the CIA. Oswald applied to the US Embassy to leave the USSR in the same month that many other Office of Naval Intelligence “defectors” also returned. Marina Oswald, in her testimony to the Warren Commission about how Oswald came to Russia and where he lived gave the details of another ONI false defector instead, Robert Webster. Eventually arriving in New York with his Russian wife and child, Oswald and his family were met by Spas T. Raiken of Traveler’s Aid. Raiken was also the secretary-treasurer of the American Friends of the Anti-Bolshvik Block of Nations, a CIA front group, part of the World Anti-Communist League and an arm of Operation WRINGER. In the summer of ’63 Oswald became involved with both the Fair Play for Cuba Committee (FPCC) and the DRE – an anti-Castro Cuban student group, both of which were subjects covered by NARA reporter Virginia Prewett and monitored if not controlled by David Atlee Phillips, a CIA officer from Oswald’s old Fort Worth neighborhood. Oswald was seen meeting with Phillips shortly before Oswald ostensibly went to Mexico City visiting the Cuban and Russian embassies monitored by Phillips’ surveillance teams. Virginia Prewett was one of Phillips’ media assets who often wrote news articles in support of CIA operations. Prewett was interviewed by author Anthony Summers and British journalist David Leigh, and although Ben Bradlee of the Washington Post commissioned Leigh to write an article about Phillips and Prewett, Bradlee refused to publish it. Summers reported that Prewett confirmed the existence of “Maurice Bishop” and his association with both David A. Phillips and Tony Veciana, one of the leaders of the anti-Castro Cuban Alpha 66 terrorist group, who had seen Oswald and “Bishop” together in Dallas. Prewett was also one of the founders of the Friends of Democratic Cuba, along with other associates and media assets of David Atlee Phillips. Many researcher believe that Maurice Bishop was a pseudonym used by David Phillips, and at least one former CIA operative has confirmed it. “Goldberg” is one of the names Oswald wrote in his notebook while in the Soviet Union, and was ostensibly a Moscow correspondent he had met, and not either Sidney or Luci Goldberg, who worked for NANA. One protagonist in George Orwell’s 1984, a favorite novel of Oswald’s, is Emmanuel Goldberg, the supposed Party traitor who writes the Book of Revolution. When Bill Kelly talked with Sidney Goldberg on the phone, he said he knew Ian Fleming from working at NANA but that Fleming left the organization around the time [Goldberg] became affiliated with it in 1963. According to Frank Greve and Rod Hutcheson (Knight-Ridder/Tribute Information Service), Luci and Syd Goldberg were close personal friends and NANA colleagues with Victor Lasky. Lucianne and Sidney Goldberg were not only associated with NANA in regards to Oswald in the Soviet Union. Luci later posed as a reporter covering the McGovern campaign, while actually working as a “dirty trickster” for the Republicans. The Goldbergs were also mentioned in regards to the Eagleton scandal, which exposed the vice presidential candidate has having had psychological counseling. Then Luci became entangled in the Monica Lewinski affair. It was Luci Goldberg who encouraged the Pentagon secretary Linda Tripp to secretly and illegally tape record Lewinski detailing her relationship with President Clinton. Lucianne Goldberg still identified herself as associated with NANA at that time. Her son, Jonah Goldberg continues in the tradition as a vehement right-wing propagandist, and somehow recently secured an exclusive interview with Fidel Castro. With editors and correspondents like Ernest Hemingway, Ernest Cueno Ivor Bryce, Ian Fleming, and Syd Goldberg, and a bevy of young and beautiful correspondents like Inga Avid, Priscilla Johnson McMillan, Virginia Prewett and Luci Goldberg, the North American Newspaper Alliance – NANA was a fully functioning intelligence network closely associated with the CIA’s Operation Mockingbird. As exemplified by the North American Newspaper Alliance (NASA), the corporate connection between the CIA and the US media is at the heart of the psychological warfare campaign that has portrayed Oswald variously as a Cuban or Soviet agent, deranged lone-nut or mob hit-man, rather than what he clearly was – an expendable agent for a domestic military-intelligence network. Oswald was an American spy and what ever his role in it, the assassination was not a foreign attack but “an inside job,” a coup. Oswald used aliases, forged identity papers, post office boxes, pay phones, dead letter drops, and micro-dot photography. He was multi-lingual in Russian and English, and could converse in basic Japanese and Spanish. He traveled widely, primarily using public transportation, and was educated by a specialist in the crafts of intelligence practices and techniques. As they used to say in the fifties, if it looks like a duck, walks like a duck and quacks like a duck, it’s a duck. Oswald was a covert intelligence operator and agent for some domestic anti-communist network. Lee Harvey Oswald went to Russia like Hemingway went to Paris in 1944 – not as a writer but as a war-time penetration agent operating behind the lines. Set up as a patsy, Oswald’s presence at the scene of the murder of President Kennedy served as a message – that the murder of the President was not only a conspiracy, but a more specific covert intelligence operation designed to shield those actually responsible. It was a plot that originated within the heart of the federal government itself and showed that those who killed the President can get away with anything. At a COPA conference on the assassination in Dallas in October 1992, a workshop panel on the role of the media in the assassination concluded that the most significant facts have not been the subject of news stories because of negligence on the part of the media. Rather than negligence however, it is clear the mainstream media response to the assassination of President Kennedy can be shown to have been influenced if not entirely controlled by the CIA from the very moment of the assassination, and they did this through the utilization of their media assets, particularly those at Time-Life, CBS News and NANA – the North American Newspaper Alliance. One Response to Was Oswald Bottle-fed by NANA? Alaine Mosby’s role in LHO’s Metropole Hotel stayover is also significant although maybe not as a covert op as PJM’s NANA actions. In John Newman’s book “Oswald & the CIA”, Newman details Mosby’s press transmission to Alan Belmont’s FBI office over the weekend. The Mosby LHO interview material reaches Belmont Monday morning. What does Belmont do with the Mosby story? Does Belmont turn Mosby’s,”moved to New Orleans/North Dakota”, LHO quote into a ref. to Stanley, North Dakota’s residence for LHO & his mother in the summer of 54? Is Belmont orchestrating the framing of LHO as a communist? See my LHO in ND Fourth Decade articles from 99/00. See also John Armstrong’s “HARVEY & LEE” where JA describes “LHO in ND” as the 1st instance of a doubling of LHO.